SELF-ESTEEM – Kids that feel bad about themselves and abilities most likely hate school too. A lot of kids that are deemed “special ed” are discouraged that they are not achieving at the level they want to. The ultimate goal is to teach your child to expect much of themselves and little of others. 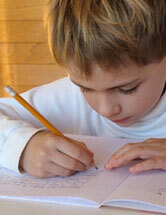 Students with Tourette’s syndrome are not automatically entitled to special education services. Eligibility depends on several factors. Simply having Tourette’s is not the only qualification. For example the child’s educational performance must be affected as a result of the Tourette’s syndrome. If Tourette’s is directly causing your student low grades and difficulty in school, you the parent will need to advocate for them. If you do not speak up, then the school may not help your child. The 504 is ideal for your child if he or she can make progress with some special accommodations. This would not be measured for gains and administered by the school’s general education department. However if your child needs a structured environment and specialized learning plan with measured gains, then the IEP is probably your best option. The school’s special education department would run this option. For helpful advice and support for students on a 504 or IEP, contact Y3K Tutor In Your Home today! We have helped many families receive the educational support they need. 504 plans refer to section 504 of the Rehabilitation Act passed by the United States Congress in 1973. This act protects the civil rights of people with disabilities. It says that people with disabilities must have equal access to participation in all programs that receive federal funding. Therefore public schools have to make sure that equal access happens for all students. One major limitation of 504 plans is that they only require equal access. They do not require that academic progress be made. Basically 504 plans provide accommodations that allow children with disabilities the same access as those without. The school’s general education department is in charge of 504 programs. If your child can be successful by using some carefully placed accommodations, then a 504 plan would be best. These plans take less time to create and are usually less expensive for the school district. For helpful advice and support for students on 504 plans, contact Y3K Tutor In Your Home today! We have helped many families receive the educational support they need. Title 1, 504’s and IEP’s are unique academic programs and mandated by separate government offices. If you have a child who requires special education, it is absolutely essential that you comprehend the difference between Title 1, 504’s and IEP’s. Understanding them is important so that you can be an effective advocate for your child. Check back here over the next several days for specifics about each program. For helpful advice and support throughout the entire Title 1, 504 and IEP process, contact Y3K Tutor In Your Home today! We have helped many families receive the educational support they need.